Take A Break Holidays Your own base to stay at. VISITING LONDON – TRAVEL TIPS FROM LOCALS. When visiting London it’s best to get travel tips and advice from a local. This video has information about what to eat, where to go and what not to say! Situated in Central London, The Rosebery Aparthotel offers apartments and suites with free Wi-Fi, a fully-fitted kitchen and air-conditioning. The suites receive a service clean once per week. Lamington Serviced Apartments are set over many beautiful Victorian buildings in the quaint, tree lined Brackenbury Village of Hammersmith and Brook Green. 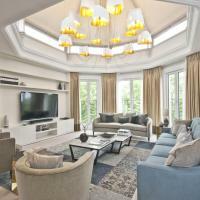 Offering modern interiors, with fully equipped kitchens and spacious living areas. All apartments include a flat-screen TVs. Full cooking facilities including oven, microwave and hob in the kitchens, with a washing dryer and dining area. A dishwasher is available in some of the apartments and some of the larger apartments include private gardens or terraces. Lamington – Hammersmith Serviced Apartments enjoy a quiet location within a short walk of live music entertainment venues and fashionable pubs. Shepherds Bush Empire, Hammersmith Apollo and Lyric Theatre Hammersmith are about 10 minutes’ walk away. The area boasts tremendous shopping, dining and entertainment attractions. Public transport connections are 5-7 minutes walk from the apartments straight to Central London and Heathrow Airport. Lamington flats are only a 5-minute walk from Hammersmith Tube Station (Piccadilly Line) and Goldhawk Road (Circle Line and Hammersmith and City Line). 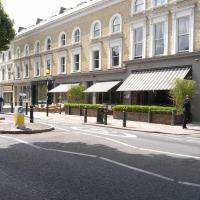 Both Chiswick and Kensington are within 10 minutes’ drive from the property. 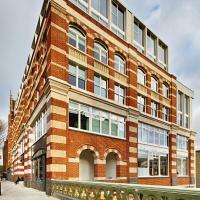 Hammersmith and Fulham is a great choice for travellers interested in museums, entertainment and monuments. The largest city in Europe, it’s undergoing a renaissance with an upsurge in exciting new bars, galleries and buildings. Here you’ll find everything from 2,000 years of history to the latest in street culture. It’s a place to stimulate the mind and the senses but it’s also one of the most expensive cities in the world. Accommodation in London can be expensive for the quality of hotel room you’ll get. Expect to pay anything from £45 per person per night. It’s best to book before you arrive in London as demand can outstrip supply. On a break the best place to stay for value and accessibility is in the Bloomsbury/Russell Square area. Come and Stay at our London Holiday Apartments. Offering a range of luxurious accommodation south of Hyde Park, the Queen’s Gate Apartments are a 10-minute walk from the Royal Albert Hall. The nearest to the West End are Victoria and Waterloo, although King’s Cross and Euston are at the northern side of that area. Marylebone and Paddington are in the west of the city, Liverpool St to the east. 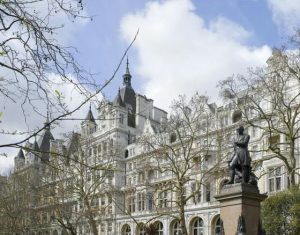 Fountain House offers modern apartments next to Lancaster Gate Tube Station and opposite the beautiful Hyde Park. All apartments have free Wi-Fi access and modern décor. By coach: most coaches arrive at Victoria Coach Station, about 10 minutes’ walk from the Victoria railway/Underground station where you can connect with Circle, District and Victoria tube lines, as well as with local transport buses. By air: Heathrow, Gatwick, Stansted, Luton, and London City airports all serve London. From Heathrow catch the Piccadilly line, the Airbus or the new Heathrow Express train into central London. From Gatwick get the rail link to Victoria station. From Stansted you can get a train to Liverpool St Station, which has various transport links. From London City Airport take the shuttle bus to Liverpool St or Canary Wharf. By car: the M1, M20, M23, M26, M3, M4, M40 and M11 all connect to the M25 circular around London. When should I go and stay at our London Holiday Apartments? What should I do when I’m there when I’m stay at our London Holiday Apartments?? 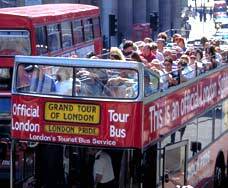 The best way to see the sights, such as Buckingham Palace, St Paul’s, the Tower of London and the Houses of Parliament is on a sightseeing bus. You can get on one at Piccadilly Circus and many other stops. For a bird’s eye view of the city, take a trip on the London Eye. On a good day you can see as far as Windsor Castle, 25 miles away, as well as London favourites like the Houses of Parliament and Tower Bridge. Away from the hustle and bustle there are lots of parks to enjoy such as Hyde Park and Regent’s Park. For a quirky day out try Camden or Notting Hill markets at the weekend. London has the greatest variety of theatre in the world, so catch a show. For museums and galleries, visit Tate Britain, the Tate Modern, the National Gallery or the Victoria and Albert, or the grandaddy of them all, the British Museum. Can I see London on foot when I’m staying at our London Holiday Apartments?? Both the centre and the City of London can easily be explored on foot. 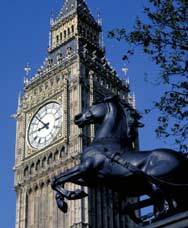 There are many organised walks, including London Walks (tel 020 7624 3978). There are also theme walks such as Sherlock Holmes and Jack the Ripper Tours. Check with the London Tourist Board. Can you take boat trips along the Thames when I’m staying at our London Holiday Apartments??? If walking doesn’t seem a good idea, catch a boat from Westminster Pier down river to Greenwich (return fare £7.50). You’ll pass Shakespeare’s Globe Theatre, Tower Bridge and the Millennium Dome – and many more major landmarks. There’s also a good craft market at Greenwich at the weekends. Take A Break Holidays takeabreakholidays, Apartments Accommodation.